At long last Capcom has released the free Heroes & Heralds gameplay mode for Ultimate Marvel Vs Capcom 3. Heroes & Heralds is a separate mode that adds new and customizable features to online and offline gameplay. Players will choose between two factions - Heroes or Heralds- and will engage in a series of battles with the opposing side to help save the world or take it over. Gameplay in the Heroes & Heralds mode will be altered through the acquisition of Ability cards that range from basic alterations (speed boost) to game-changing, combo enhancing powers (invisibility or ability to pass through projectiles). Cards can be used in online and offline versions of the Heroes & Heralds modes as well as the training mode. Ability cards are based on classic Marvel and Capcom characters. 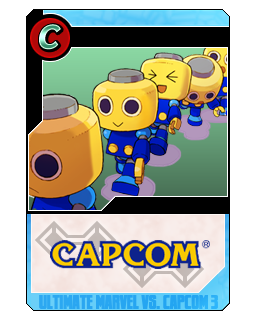 More specifically, the mode allows players to outfit their team of fighters with cards based on famous Capcom and Marvel Comics characters that sport a number of interesting effects. One card might turn your team of three into a team of one, while another might turn your fighter invisible. All told there are over 100 such cards in the new mode and while you're granted an initial handful, you'll have to play the game to unlock the rest. Additionally, Heroes & Heralds brings with it a new online gameplay mode in which players choose a side (either Heroes fighting in defense of Earth or Heralds of the planet-devouring Galactus) and battle for control of virtual territory. Most crucially, all this added stuff is totally free of charge. Just fire up your console of choice, drop in the Ultimate Marvel Vs Capcom 3 disc and as soon as you start the game, you'll be asked to install the pertinent update. Oh, and those of you still complaining that Mega Man is nowhere to be found in Ultimate Marvel Vs Capcom 3? Sorry to crush your contrarian dreams, but the Blue Bomber does make an appearance with this update. Granted, he's only a still image on a relatively underpowered card, but that's better than nothing, right?